I was seriously injured in a car accident and the other party only has minimum coverage. What are my options? I was involved in a crash and the car insurance company denied my claim and closed my file. What can I do? 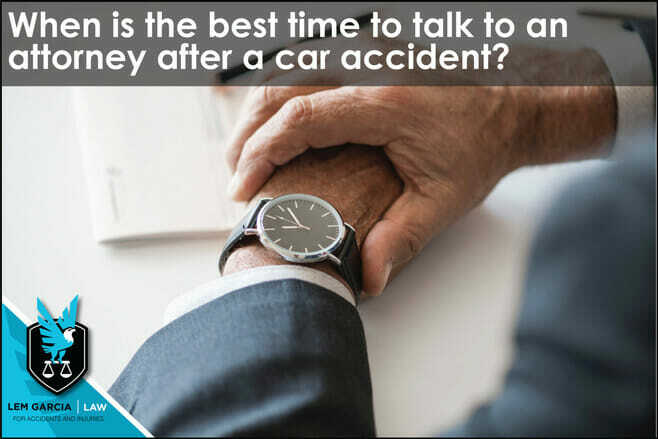 When is the best time to talk to an attorney after a car accident? The best time to talk to a personal injury attorney after a car accident is as soon as possible. It is important not to wait too long to speak to an attorney because there may be important steps that you need to take to make sure that you will get compensated fairly for your car and your bodily injury claim. Many people believe that you should always call the insurance companies involved in your case before talking to an attorney. This is not true. Insurance companies do not have a duty to act in your best interest – only an attorney must act in your best interest. Whether you speak to your own insurance company or the other party’s insurance company, they are both trying to find ways to either deny your claim or reduce the value of your claim. If you talk to the insurance companies first, they will want to gather information from you about the crash and they will also want to take your recorded statement. The purpose of the recorded statement is to hurt your case and diminish its value. Some insurance companies and adjusters might even attempt to persuade you to sign a settlement release for a fraction of what your case is worth. It is very common for insurance adjusters to offer you $500 to $1,000 for your pain and suffering and to set aside $3,000 or so for your medical treatment – way before you even know the extent of your injuries. If it turns out that you need treatment that costs more than $3,000, they will no longer pay for it because you already agreed to $3,000 for your medical bills. To make matters worse, you will not be able to recover anything more for your pain and suffering because you already accepted their offer that was between $500 and $1,000. These are just a few things that insurance companies do to try to diminish the value of your case. Insurance adjusters handle claims all day long and know how to hurt the value of your case. It is best if you have an attorney represent you to avoid the headache and runaround that they might give you. West Covina car accident attorney, Lem Garcia Law provides free case consultations without any obligation whatsoever. We want to make sure that you are fully informed and don’t get taken advantage of when you have been injured in a car accident. Call us today for your free case consultation.